Maruia River flats below Lewis Pass, in breaking weather. 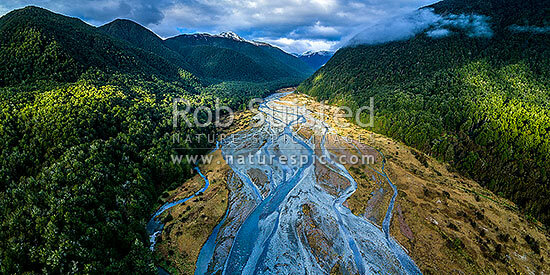 Aerial view of braided river flats and beech forest. Mt Mueller (1630m) and Freyberg Range at left, Opera Range and Spenser Mountains distant. Panorama, Maruia Springs, Buller District, West Coast Region, New Zealand (NZ), stock photo.